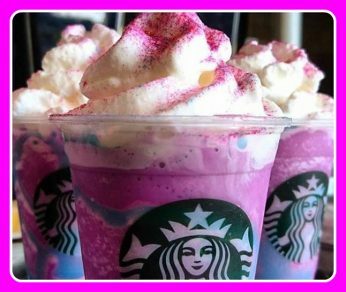 It seems lately on every social media site there is a photo of someone drinking the new Unicorn Frappuccino. Either they really don’t know what’s in them or they really don’t care. If you do care what your children drink you will want to know this. I’m glad this drink is only for a limited time, not that I think the other drinks they serve are healthy. I know that I won’t buy it but to each their own. For starters, it contains 1 1/2 times the amount of sugar that is recommended a day . Here are the nutrition facts straight from Starbucks menu. Caffeine 0mg***Percent Daily Values are based on a 2,000 calorie diet. **Each caffeine value is an approximate value. Just by looking at it you can imagine the amount of sugar and fat that’s in it without even seeing the ingredients first. From what I heard it’s a huge sugar rush. Let me know what you think, have you tried it or would you?